The "spirit of gravity" and all of its connotations is central to the writings of Friedrich Nietzsche. In Nietzsche's Thus Spake Zarathustra, Zarathustra proclaims that the spirit of gravity is his devil and that it can only be vanquished through laughter. In this explication, I will show that Nietzsche uses intertextual allusion to place this laughter that destroys the spirit of gravity in relation to the words of the character Clytemnestra in Aeschylus' Agamemnon. I will also show that Nietzsche binds this allusion to aphoristic text, thus framing aphorism as a multivalent form of writing that destroys absolute, serious and logocentric notions of truth. I argue that because of this association the reader is forced to read Thus Spake Zarathustra as a parody of the Bible and of logocentric text in order to truly decipher its meaning. 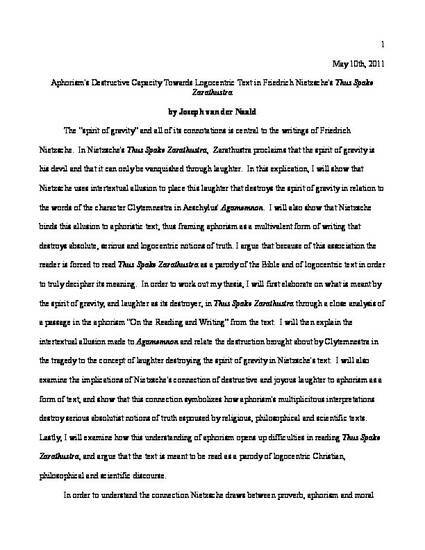 In order to work out my thesis, I will first elaborate on what is meant by the spirit of gravity, and laughter as its destroyer, in Thus Spake Zarathustra through a close analysis of a passage in the aphorism "On the Reading and Writing" from the text. I will then explain the intertextual allusion made to Agamemnon and relate the destruction brought about by Clytemnestra in the tragedy to the concept of laughter destroying the spirit of gravity in Nietzsche's text. I will also examine the implications of Nietzsche's connection of destructive and joyous laughter to aphorism as a form of text, and show that this connection symbolizes how aphorism's multiplicitous interpretations destroy serious absolutist notions of truth espoused by religious, philosophical and scientific texts. Lastly, I will examine how this understanding of aphorism opens up difficulties in reading Thus Spake Zarathustra, and argue that the text is meant to be read as a parody of logocentric Christian, philosophical and scientific discourse.